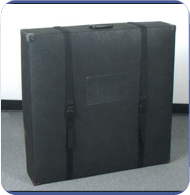 We offer custom made protective carrying cases that are specially designed to perfectly fit our patented money blowing machines, cash cubes and cash booths. Built to last, our cases will protect your LR Money Machine Cash Cube and make transporting and storing it a breeze. If you need money machine promotions then give us a call at (386) 871-2625 or fill out our contact form.